What do you think about when you think of the republican south and the Bible belt? You’ll probably think of evangelicals preaching the sanctity of marriage and conservative government spending. In 2009, the governor Mark Sanford betrayed the people of South Carolina and the nation. Here is where the hypocrisy of evangelical republicans will say, “but we should forgive him, that is our Christian duty’ or “whoever is without sin cast the first stone”. Where is that forgiveness and lack of condemnation in regards to the LGBT community. If the sanctity of marriage is their only reason to oppose two men or two women the right to legally love one another, where is the sanctity of marriage when the leader of a state tells the people he’s on a trip in the Appalachian Trail? Only to be found out to be fornicating with his younger spicy Latina mistress in Argentina. The poor betrayed wife, Jenny Sanford was left behind to face the onslaught of a carnivorous media. Secondly, they’d like to say, ‘oh but that is his personal life, that has nothing to do with his work”. Yes that seems easy to say now, but where was that mentality for former President Clinton. Regardless of his personal indiscretions, SC taxpayer dollars were used looking for 3 days in “trail” for the leader of our state, all while he may have been rolling in the sac. Is that part of conservative spending, to miss use the tax money of the hard working South Carolina tax payer? Is that the kind of man we’d hand over our dollars to again? It seems many republicans are willing to. Their one sided hypocrisy is nothing new. Anyone following politics for more than a decade can see that what’s good enough for them to do and get away with is not equal to what we can do and easily be forgiven for in everyday society. African-Americans-Hispanics-women and LGBT people in South Carolina can’t seem to catch a break, yet we are asked by Mark Sanford, in his own ad, tell us that because of his mistakes he has been made a better leader. Well there is some truth to that, go to any state prison and ask and they’ll tell you that being caught for your crimes only puts you in company of fellow criminals that teach you better ways at being a criminal. In Mark Sanford’s case, maybe he has learned how to be a better liar, so that this time we’ll never ever suspect what he’s up to again. Recently he won the republican primary for the first congressional district seat and now faces Democratic leader Elizabeth Colbert-Busch. In the Washington Post, National Republican Congressional Committee Chairman, Greg Walden says, “South Carolina families clearly deserve a continuation of the strong fiscal discipline displayed by now-Senator Tim Scott and will greatly benefit from Sanford’s fiscal hawk approach.” Of course they would like to continue their tea party agenda of forcing their moral issues and beliefs on the people of South Carolina, but Mark Sanford as a spokesperson for morality? Give me a break. I still have faith in the average SC voter, especially its people of color, the sane percent of the lgbt community and women to see thru the shame that is being plaid on us. 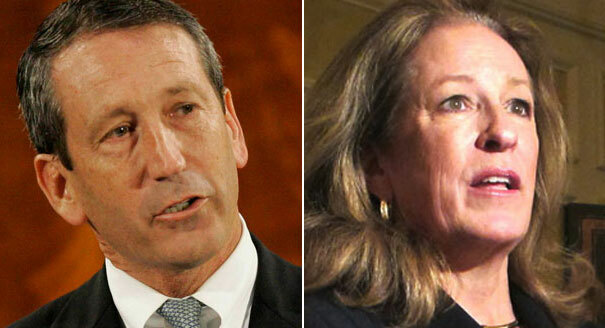 The Republican media is even at this moment trying to convince us that the mistress, now fiancé will be a bonus for Sanford’s campaign as detailed in the Washington Wire. I guess the thought they have is that we ignorant masses will just fall to the feet of his mistress made fiancé because she made an appearance and is beautiful. Regardless it will be interesting to see the male chauvinist go head to head with the most successful business woman in the district April 17th, 2013. Until then I will continue my support for Elizabeth Colbert Busch, even though she is a more conservative democrat than most on the national level, but only fiscally. Socially as LGBT people we would have no better representative in our state politics than Elizabeth Colbert-Busch, so I urge LGBT people in the First District (coastal southeastern section) , which is the largest LGBT area of the state, to let their voices be finally heard by casting your vote for Elizabeth Colbert Busch May 7th, 2013.